Working With Us – it’s easy! Although you can use our catalog to design and develop a bill of materials and place an order consisting of quantities and part numbers, in most cases it is better to let us design the project. Working with us from the quoting stage through the design and delivery of the project is a simple process. 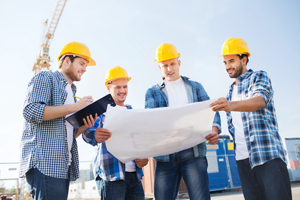 Budgetary pricing– if you have a simple project in mind and need budgetary pricing for engineering estimates give us a call, email us, or use our Quote Request form, and we will get you a budget price rather quickly. All we need to know is the footage involved, sizes and load rating of trenches, and the number of turns and tees. • documents; Word, rtf, txt, pdf. • other; any MS Office format. If you prefer you can fax the information to us at 859-781-1085. If you don’t have an official bid package then send us a site plan drawing that shows the basics of the project. A simple line drawing will suffice. Note the sizes and rating of the trench as in the example below. Order– upon receipt of an order we will design and draw the project in AutoCAD. The drawings will show all dimensions, bill of materials, weight of each piece, installation notes etc. The drawings will be sent you for approval. Approval is required before any special pieces (miters, tees, short lengths etc), and non-stock items can be fabricated. A final set of drawings will be sent for field use and archival purposes. In addtion the drawings will be stored on our server by job number and accessible from our Order Status page. You can also check the status of production and shipping on our Order Status page. Delivery– most orders will be delivered via flat bed truck carrier. Small orders may be shipped LTL (less than truck load). The site contact will be called 24-48 hours prior to shipping so they can be prepared to off load the truck when it arrives.